Special to the Journal/Gary Leininger Beaver Local’s Jared Wright pins Akron Hoban’s Jake Harbarger during one of his four wins at 138 pounds Saturday. Wright collected his 100th career victory as the Beavers won the regional title and advanced to the OHSAA state dual team tournament for the first time. ALLIANCE — In the storied history of Beaver Local wrestling, the Beavers have accumulated enough individual and team awards to fill a museum. But on Saturday in Alliance High School’s Harry Fails Gymnasium, the Beavers took it to another level by winning the Division II, Region 12 title and advancing to next Sunday’s state dual team tournament — becoming the first Columbiana County team to do so. The Beavers punched their Columbus ticket with a 51-21 dismantling of another outstanding team, the Louisville Leopards, in the regional final Saturday afternoon before a large following of Beaver Local fans that made the trip to Alliance. 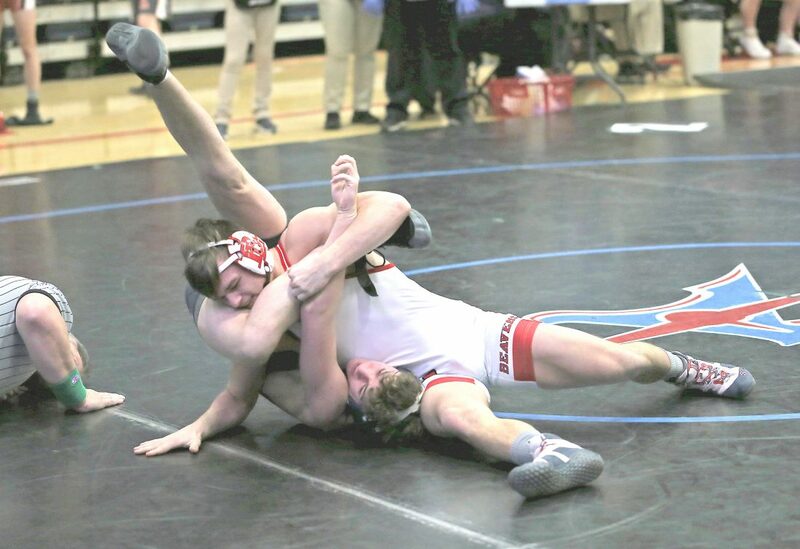 “We were fired up and ready to go,” explained Beaver Local 126-pound standout Cole McComas, who was one of nine victorious Beaver matmen against Louisville. “We were wrestling for each other, we weren’t just wrestling for ourselves. We knew what we had to do to win and we got fired up and went out and did it,” he added. Beaver Local will be one of the Division II teams competing at the state dual team tournament next Sunday at historic St. John Arena in Columbus starting at 11 a.m. with the quarterfinals. The Beavers (10-1 on the season) opened the regional tournament Saturday morning with a 69-12 romp over Akron Hoban followed by a 55-12 rout of Minerva. The Beavers then recorded a very satisfying 38-30 revenge win over a Canfield team that handed them their only loss in a controversial decision earlier this season. That win vaulted the Beavers into the final against Louisville, which had bested Steubenville 39-30 in its semifinal. To say the Beavers were pumped up on Saturday for a chance to make history and advance to state would be an understatement. The Beavers wrestled a flawless finals match against Louisville, winning the first seven matches, including four by pin, to take a commanding 35-0 lead after the 145-pound class. “We’ve had a good year so far, unfortunately both of our losses have come to Beaver Local,” said Louisville coach Rocky Laughlin. In all, the Beavers tallied six pins against the Leopards, but the one that set the tone of what was to follow was the 1:10 pin by Beaver Local freshman phenom Logan Ours over Louisville’s Garett Lautzenheiser, ranked second in the state in Division II. “Lautzenheiser’s loss was a big loss because that was between the number-two and number-three ranked kids in the state,” said Laughlin. Other Beavers winning by pin in the finals were Jaymin Salsberry (106 pounds), Mark Emerling (113), Cole McComas (126), Logan Krulik (160) and Brenden Severs (170). Earning triumphs by major decisions were Jonathan Potts (132), Skyler Lasure (145) and Beau Smith who became Beaver Local’s all-time individual record holder for wins with a staggering 156 triumphs. Winning by a decision for the Beavers was senior Jared Wright (138), who also won his 100th career match earlier in the tournament. Leading 51-3 and with its Columbus berth secured, the Beavers forfeited the last three matches to Louisville at 195, 220 and 285. Williams said the Beavers’ great preparation in the wrestling room and competing in an incredibly tough region will prepare them well for state. “It (going to the State Duals) just adds on to an even better high school experience, it’s up there and really awesome,” added Smith. West Branch defeated Salem 58-21 in its opening bout Saturday but was eliminated in the next round by Steubenville 40-28. Winners by pin for West Branch against Salem were Christian Wayt (120), Jonah Thomas (132), Brock Wilke (145), Gage Bickley (152), Steven Marra (160), Colin Lawniczak (170), Neil Ginnetti (182), Kenny Marra (195) and Jacob Hurst (285). Winning by major decision was Thomas Caserta (138). Winning by pins for Salem against West Branch were Tony Seddon (106), Caiden Hart (113) and Sam Murray (220), while winning by a decision was Jacob Frost (126). Salem coach Drew Hart said Saturday’s rugged regional was a learning experience for his young team. Winning by pins for West Branch in its loss to Steubenville were Tyler Hicks (113), Kenny Marra (220) and Jacob Hurst (285). Winning by major decision was Christian Wayt (120) while winning by decisions were Alex Courtney (106) and Steven Marra (170). “We kind of scouted Big Red through the week,” said West Branch coach Chris Dorris, “and we knew realistically we only had one move to try to match up with them and we were hoping we weren’t going to give up bonus points, but when you give up bonus points to a team like that it’s hard to come back from.